Tropical Storm Emily struggled through most of last night and today with disorganization, an aftereffect of its multivortex structure as an unnamed disturbance. However, it has become better stacked today, with convection blowing up over its center. It still has a long way to go, despite its more pleasing appearance in satellite photos. Steering in the short term is straightforward. Emily has been generally on the left side of the forecast track for most of the day, and it is now expected to make landfall in the Dominican Republic as a tropical storm. Weaker systems generally weather the mountains better than stronger ones, provided that they do not linger in the area; therefore dissipation of the system seems comparatively unlikely. The models have largely converged on a scenario in which the trough that is to weaken the Bermuda High will be gone before it can force the full recurvature of Emily. The ridge is expected to build back in, and the GFS shows the hurricane being trapped off the coast of Florida, unable to move ashore because of another ridge, stalling until a shortwave trough lifts it away. The GFDL and HWRF models, which take their input from the GFS, both show a very close approach to the east coast of Florida, with the HWRF showing near-hurricane-force winds onshore. The NOGAPS shows this same scenario without the stall. In this scenario, a landfall on the Outer Banks of North Carolina occurs, followed by a pull up the Atlantic seaboard (offshore) and out to sea. The Canadian model shows a very weak system, probably no more than a mild tropical storm, making landfall on the east coast of Florida and then being merged into the shortwave. I should observe that the Canadian model now shows the first low strengthening to 988 mb at sea and reducing the Bermuda High to its winter stage (the Azores High), which does not seem remotely reasonable to me for an August system. I am not putting a lot of faith in this aspect of the Canadian solution. The European model also shows a “screwy” solution, amplifying the shortwave trough to 992 mb at sea, while completely dissipating Emily over Hispaniola. Although unlikely in my opinion, dissipation of the tropical storm is certainly possible, as yesterday’s blog entry said, but I am having great difficulty believing that either of the baroclinic low pressure systems involved in this will reach 990 mb levels. 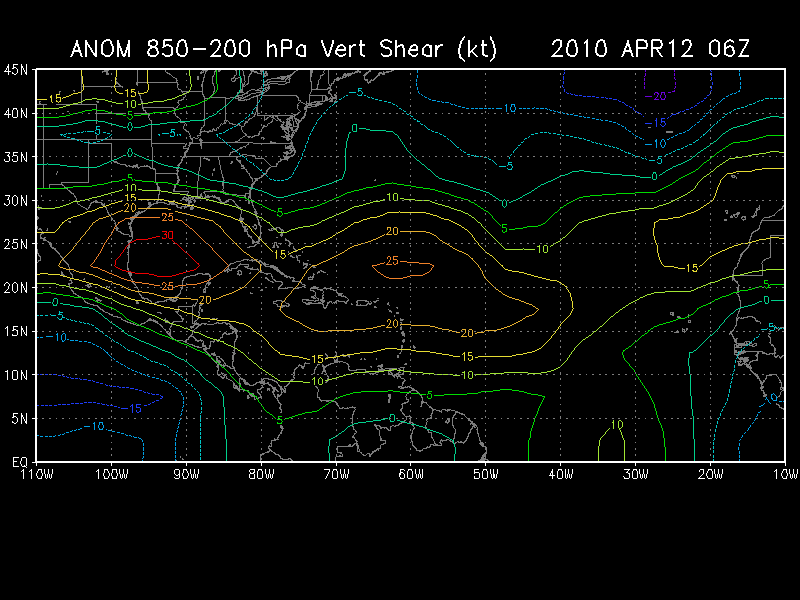 The first trough is currently located in New England producing a severe weather risk, and it is analyzed at 1002 mb. Bottom line, I am giving a highly skeptical eye to anything that destroys the Bermuda High at the beginning of August and amplifies low pressure cores to winter levels, especially when they have not been doing this consistently. Any land-free recurvature of Emily depends entirely on such “bombs,” and the approach to the East Coast will be so close that a weaker trough or shortwave will make all the difference in the world in what wind speeds are felt onshore and whether landfall occurs. As should be apparent, the threat to the Gulf Coast states has decreased over the course of the day (with a caveat). The current thinking is that the trough will lift Emily northward enough to miss an entrance into the Gulf of Mexico. However, this could change if the storm stays south and west enough, or the trough is weaker than expected at sea. I think it’s safe to say that I am joined by a substantial part of the Southeast and Midwest in bidding a very loud “GOOD RIDDANCE” to the 2011 spring severe weather season, even as a student meteorologist. This season took a toll on me in a way that I honestly did not expect. It is painful to watch such atmospheric carnage unfold when the career you have embarked upon, whether as a forecaster or a research scientist, is intended to minimize such tragedies. Even when it is fairly universally recognized that the disaster was not in any way the fault of meteorologists, that only leaves a sense of helplessness. So yes, I am quite ready to say “good riddance” to the tornadoes, at least in this particular corner of the world, for a few months. The Southeast, along with much of the rest of the East, is embroiled in a heat wave at the moment, a fairly sure sign that a summer pattern has taken hold. On that cue, enter hurricane season. Hurricanes were my first atmospheric “love” and even the season of 2005 did not change this for me. It is with a sense of excitement that I start opening up my tropical web browser bookmarks regularly again. I don’t see a lot of point in making a specific numerical forecast for this year’s hurricane season. Suffice it to say that my best guesses that I formed in winter are unchanged, and that I expect an active season with a higher-than-average chance of American strikes, unlike last season. I am not expecting a transition to El Niño, which would tamp down activity in the Atlantic, but I am not entirely sold on the expectation that the ENSO state will remain neutral throughout the season. I think there are close to even odds that it will begin to return to La Niña conditions again by autumn, albeit milder than those of last winter. However, either pattern will promote tropical activity. Did I mention checking tropics-related web bookmarks once more? 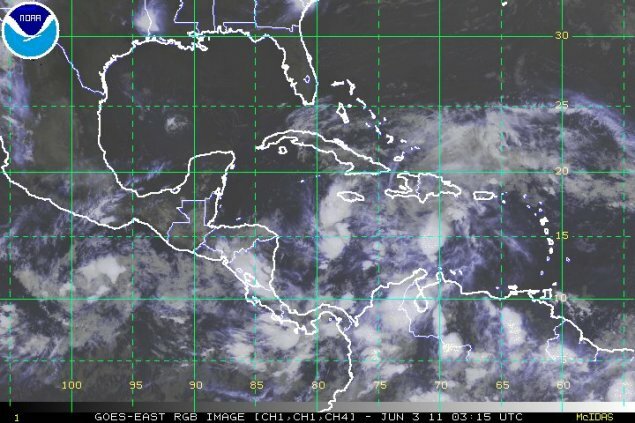 Well, it turns out that the Atlantic basin is following the “official” calendar right on schedule, so I have reason to look at the tropics regularly already. 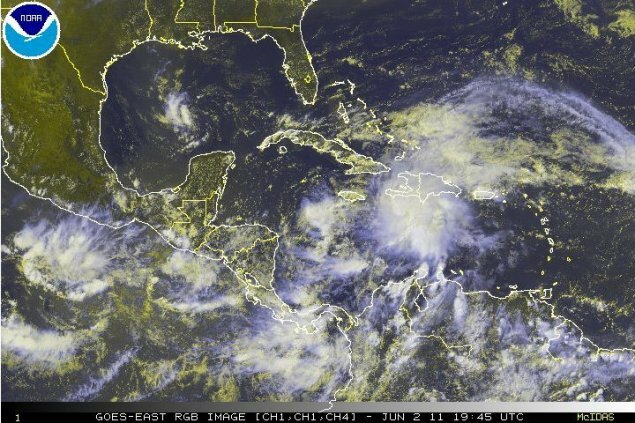 There is a disturbance in the Caribbean Sea that is the first really interesting possibility for tropical development. The area of convection to its east is associated with a tropical wave that is expected to merge with the low, adding energy and moisture to the brew. As the images indicate, the area of convergence is the chief culprit in the misalignment. 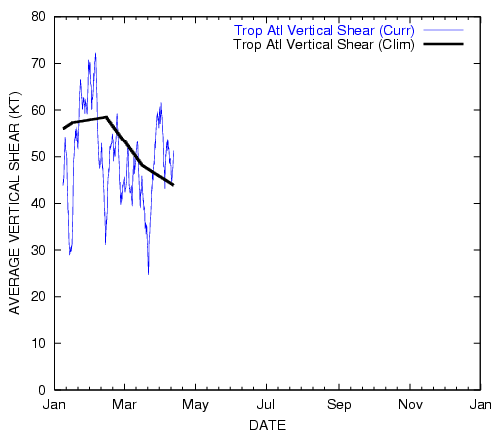 The divergence is occurring above the area of convection, indicating that the low is developing a system for ventilating itself. This is no surprise for this early in the season, but the National Hurricane Center expects the environment to become more favorable for this system in the next couple of days. An examination of the GFS model indicates that they are probably correct in this expectation; though shear is expected to be prohibitive of any tropical activity in the Gulf of Mexico, it is supposed to lighten up around the low pressure center. Incidentally, the GFS doesn’t seem to do much with this cyclone other than letting it churn in place. Don’t expect a hurricane out of this! At best, I’d say it might rate a tropical depression. It is primarily an interesting feature to watch for so early in the season, a harmless storm that we tornado-weary weather folk can observe without anxiety. Tropical cyclogenesis is a fascinating, somewhat mysterious, and awe-inspiring phenomenon, and instances like this that are not the classic “Cape Verde wave in September starts to spin in the middle of the Atlantic” pattern are particularly interesting because the process of genesis for them is not cut-and-dry like the well-known central Atlantic tropical wave process is. This system may very well be a harbinger, but that remains to be seen. For now, it’s a neat feature to watch. From the point of view of a snow lover, it was an excellent winter. But that is now long over for those of us in the Eastern United States. Many areas have already hit 90°F! Here in MS we have not, but I anticipate that some spot in the Gulf Coast states will reach this wretched milestone early in May. Before I get to the topic about a future event, I feel compelled to talk about one closer to the present. Severe weather season is upon us, though it is off to a slow start. The Southeastern states are arguably past the springtime peak and seem to have gotten off quite light, but we must not forget that it is the months of May and June when so many major tornado disasters have occurred. Jarrell, TX… Moore, OK… the May 2003 outbreak sequence… Greensburg, KS… Parkersburg, IA… those are all F5 or EF5 events except for 2003 (and even it had a tornado that was considered by some to have been underrated as F4). The list goes on, and it does not require an EF5 tornado to do massive, tragic damage. But it is very difficult to forecast severe weather more than a few days in advance, let alone a month or more. Hurricane season is a different matter, and it is quite possible to make long-range forecasts about the overall activity level of a particular season, especially now that we are merely a month and a half away from the beginning of the Atlantic season. 2010’s hurricane season is not, I believe, going to be anything at all like 2009’s. The strong El Nino event that gave the Eastern U.S. such a cold and snowy winter (and killed off much Atlantic hurricane activity) is fading fast. The majority of ENSO models predict a return to ENSO-neutral conditions by the June-July-August period (link: PDF). However, El Nino has left its mark. As is typical following a significant El Nino event, sea surface temperatures in the eastern Atlantic are well above average, and in fact, the anomalies for this year are greater than the anomalies in April of 2005, a year that had record heat across the ocean. In the far eastern part of the ocean, there are areas that are already at 30°C. Note: All graphics in this post are created by NOAA and are therefore public domain. I have downloaded the graphics current for 04/12/2010 to my server to avoid taking U.S. Government bandwidth. Links to the pages where these graphics were found will not point to the same images at dates in the future. If this continues and shear decreases as expected, this year may be quite good for long-tracked Cape Verde systems. Indeed, these temperatures are apparently a record in terms of warmth. The Gulf of Mexico is below average, but this is because of the cold winter. With surface temperatures reaching into the upper 70s and low 80s in the Gulf states for the foreseeable future, and little cloudiness to moderate the effect, it’s likely that this body of water will warm up. Indeed, observing the sea surface temperature anomaly maps for the past few weeks indicates that this warmup is occurring already. The Bermuda High, an area of high pressure that extends to the western Atlantic, is not yet established. The location of this feature will be important to watch, as it determines whether long-tracked Cape Verde hurricanes tend to strike land—and what landmasses that they strike—or recurve to sea. The farther west it goes, the more likely that such hurricanes will hit a coastline, but too far west and storms tend to be steered south of the United States, as was the case in 2007. In short: Sea surface temperatures are likely not going to be a problem in 2010. I think the features to watch, here in the pre-season, will be the evolution of ENSO, the location of the Bermuda High, the warmup of the Gulf and far western Atlantic near the Bahamas, and the levels of wind shear as compared to climatology. If the ENSO level decreases to neutral by the peak of the season and shear decreases to the climatological average (and these two factors are very intimately connected, I should note), but sea surface temperatures continue to remain high, I fully expect to see some beasts brewed up and for “Category 5” to make a reappearance in this basin for the first time since 2007. Unless the ENSO prediction models are mostly wrong, the Atlantic coasts are not going to get off light this year. It’s impossible yet to determine what areas are likely to be targeted, since we do not know how far west that the Bermuda High will set up, but at present I would go out on a limb and say that somebody is in for a bad year. It’s time to start getting ready.